This is a set of 250ml bottles of Coconut Oil, Castor Oil, Jojoba Oil, and Palm Kernel Oil. 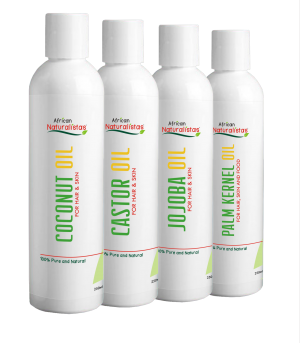 Purchasing our Hair Growth Oil Set enables you to save money while getting maximum benefits from the individual oils. It also gives you the opportunity to create your own unique blend of oils for your hair and skin.